Today Teena and I went on a walk put on by Heritage Toronto on the Lost Breweries of Toronto. The walk was led by Jordan St John, in the blue shirt above, a beer expert who literally wrote the book on the subject, Lost Breweries of Toronto. We started outside the Moss Park Community Centre, where we were given a short history of beer. Then it was off to the site of Toronto's first brewery, Henderson's Brewery. A historic walk on beer and an ad for Moosehead beer which has been around since 1867. This was not part of the tour but is a building I just love. It was Paul Bishop's house built in 1848, upon the stone foundations of the original house built in 1798 for William Jarvis. At the corner of Front and Parliament was W. Copeland's East Brewery. Once again, then and now. Jordan also talked about brewers whose breweries were not on the tour. 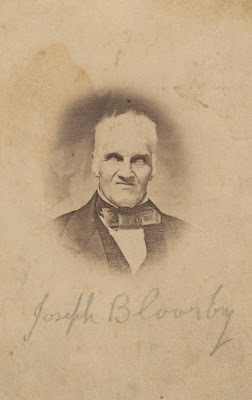 Bloor Street is named after brewery Joseph Bloor, who Jordan suggested that we Google a picture of. Yes, he is a frightening looking fellow. We stopped in a park (and shade) beside Enoch Turner's schoolhouse. Jordan explained how Enoch had a brilliant business plan. People liked to drink and he wanted them to drink his beer. People needed money in order to buy his beer, so needed good jobs. To get a good job, one needed an education. So he built a school to educate them! Then it was over to Old Brewery Lane behind the Toronto Humane Society where the Don Brewery once operated. It is one of the few remaining brewery buildings from the original period and is now condos called the Malt House. Thomas Davies, who owned the brewery and was also a Toronto Alderman, was so influential that he actually had the city pay to have the Don River straightened so it no longer ran beside the brewery so he could make a railway siding to ship his beer. Our final stop was the Dominion Breweries building, that is still standing and was run by Thomas Davies' brother Robert. The brewery won world beer awards and seemed to be a decent place to work in that across the road at Davies Terrace, Robert built places for his workers to live. Jordan's book was excellent and he is a great tour guide. He has funny, interesting and extremely knowledgeable. He really knows his stuff and there wasn't a question asked that he couldn't answer. We stopped at a few more places than was shown here. It was a really enjoyable tour.